The Green Door is an Insulated Flip Flap Doors and is a user friendly replacement for the unwieldy ‘night door’. It is light weight, requires less physical effort to operate and also reduces the build-up of ice. • Eliminates the use of a heavy night door, saving enormous, running costs and physical effort. 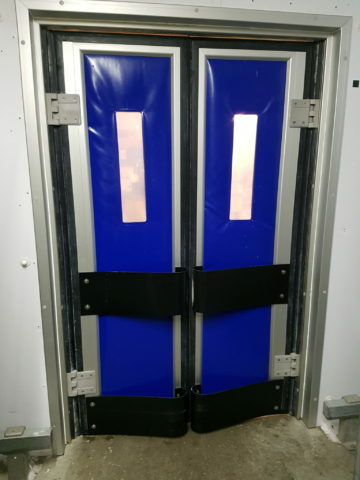 • For freezer applications, doors with heater wires are fitted. • Unique profile and gasket prevents thermal bridging and servicing. • Built in shock resistant impact buffers. When ordering your Green-Door, please add an extra 260mm to the width of your widest product entering for a single door, and 450mm for a double door.